Sometimes I share what we do in our homeschool, but the truth is that everything we do at home, well, anyone could do at home. We all teach our children- it’s called parenting! Homeschool just requires a bit more focus, but in my opinion, it’s a pretty natural extension of parenting. 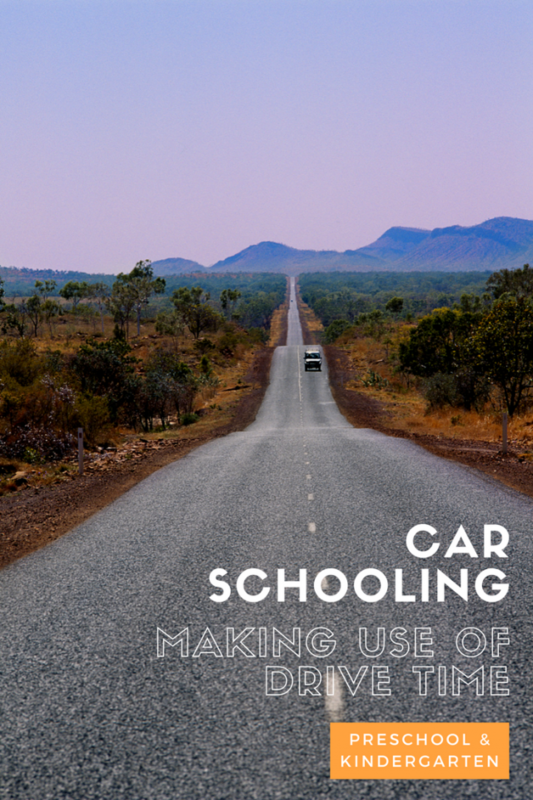 I realized not long ago how much “homeschooling” we do in the car, and since then, I’ve had a post about CarSchooling on my mind. We don’t do videos unless the road trip is 3+ hours, but we always have music, stories, or podcasts playing. Here our some of out favorites! Count, Add, Subtract! : Warning, it’s super catchy and I find myself singing these math songs when I’m on my own. They’ve helped both girls pick up everything from counting and skip counting, to adding and subtracting. Camp Songs with Ella Jenkins and Friends : So many good songs to sing along to, like This Land Is Your Land and Sloop John B. and This Little Light of Mine. We love this one. Here Comes Science : A CD that every science lover should have it- fun facts about science to a beat? Good stuff! Little People Sing-a-long Favorites but we also love all the Little People CDs : The kids have loved these since they were tiny toddlers. They are cutesy and fun and we all still sing along. Tell Me a Story and honestly anything else read by Jim Weiss : His voice is like butter and entrances both girls. They seriously both gaze out the window in silence and just listen. Amelia Bedelia Audio Collection : Hailey is is a serious Amelia Bedelia phase right now. I think it’s because she finally understands the irony and thinks it’s hilarious. The House at Pooh Corner : I’m a sucker for a classic. Disney’s Songs and Story : These CDs have about 4-5 songs from the motion picture, then tell an abridged version of the story (8-13 minutes long). They are so much fun for Disney fans! Wow in the World : From NPR, hosts Mindy Thomas and Guy Raz guide curious kids and their grown-ups on a journey into the wonders of the world around them. Story Nory : A great collection of free kid-friendly audio stories. Story Pirates : We have not listened to this yet, but so many people on Instagram suggested it to me I had to include it. From the site: The Story Pirates aren’t your typical swashbuckling sailors. We don’t steal gold, pillage villages, or claim land; We’re searching for a different kind of treasure: kids’ wildest, most imaginative stories. Good Night Stories for Rebel Girls : A story podcast about real-life inspirational women, based off the popular book Good Night Stories for Rebel Girls. I’ve shared with you how we keep our car clean, which helps me keep my sanity. 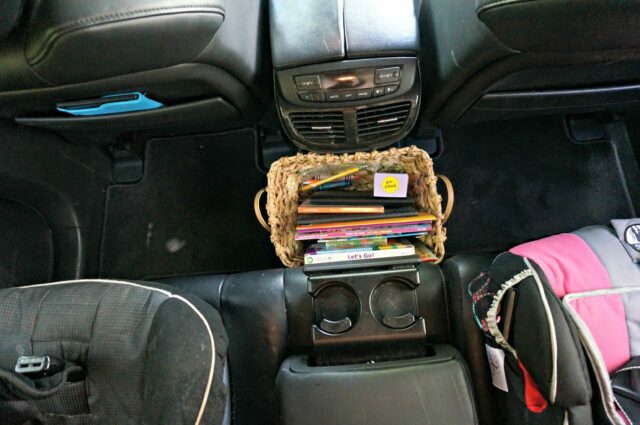 Another huge helper for carschooling is a good middle seat organization system. I love this one. I know in today’s world most of us spend a lot of time in the car. It’s been really fascinating to me to realize how much learning takes place on the road. If you have any favorite carschooling podcasts, workbooks, songs, or activities, I’d love to hear what they are! What do your kids like to do or listen to in the car? I like how you have a very wide perspective on what “parenting” is and the many ways that you can teach your kids about life in the fullest sense. They are sponges absorbing every word, gesture, and vibe send forth by parents. You’re filling them up well with the “good stuff”! John J. recently posted..Extended Family: Boon or Bane? It Can Impact! I so agree with you and learning in the car. 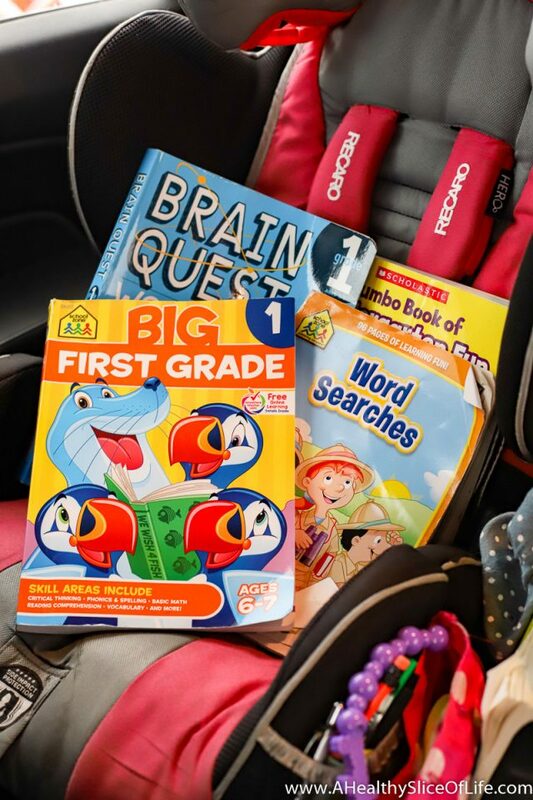 We too never did movies in the car unless we were on the way to grandma’s 5 hours away, but that also included books and other fun stuff time. Something else we did was encouraged them to look out the window so they could learn their way around town and on long trips just enjoy the change of scenery. This in turn helped them a lot once they started driving. Today, so many kids have their head down while riding in the car and then once they started driving didn’t even know how to get to the local mall. Shocking!! Thanks for sharing these, totally bookmarking it. Thanks for the workbook and podcast recommendations, I will definitely try them! We take frequent longer weekend drives and typically drive for vacation. We logged roughly 30 hours in the car (of which our 4 year old didn’t sleep a minute of… even after long hikes and big lunches?!?!) on our last national parks road trip (8 days). My 4 year old did a lot of coloring and crafting on his activity tray, looking out the window, asking questions, “reading” magazines and books. We also played some games of I-spy. My husband and I have been reluctant to give up control of the music and podcasts, but the boys seem to enjoy any music and I don’t think they are quite following podcasts yet (probably a good thing, since we were listening to things like “Criminal”). Back and forth to school/ work/ stores we usually just listen to the radio, or talk. Usually it is welcome downtime for me between teaching all day and taking care of my kids. I’ve been using you as inspiration to not rely on the DVD player as much in the car! Because honestly, we have pretty short drives most places. My daughter is switching to a school further away next year and I fully plan on doing podcasts and listening to stories on the drive. I love this idea in theory, but am I the only one who just feels like this is one more area where mom-guilt comes into play? Not to criticize you AT ALL, because I’m genuinely amazed that you spend time in the car teaching your girls so much. I just have always seen car time as down time. No screens (unless we are going on a long car ride, then we definitely do movies! ), no games, no kids music, we’ve never even really brought books or anything except one small toy per child. I’ve always just listened to music that I like (that’s appropriate, of course) and let my kids look out the window. I guess maybe we are in the car less than a lot of people though, my kids are 3 and 5 and the most time is spent going to preschool or the gym and back home. I guess I’ve just never wanted to go down the road of entertaining them on a car ride for fear that they will come to expect it every single time we drive. I’m with you Liz. As a SAHM I feel like all day long it’s teaching moments and it’s exhausting and once we are in the car, I claim it as my time for me to jam out to whatever appropriate music there is and let the kiddos look out the window and chat amongst themselves. I feel like if every moment from the car to the grocery store is filled with activities and teaching moments, then the kids constantly expect that, needing your attention without being able to explore their own imagination and creativity. I chauffeur my kids around a lot and there are no activities in the car. Hey Liz and Elisabeth! I am not a fan of mom guilt so I’d hate to think I’m responsible for making a fellow mom feel it. I am a total believer in kids being bored (I’m no stranger to the phrase “go play!”). What I hoped to share were ideas that we love for making our time in the car more enjoyable for all of us. I jokingly roll my eyes about kid music and podcasts, but honestly, I kind of love listening to it all with my girls because it sparks some great conversations. 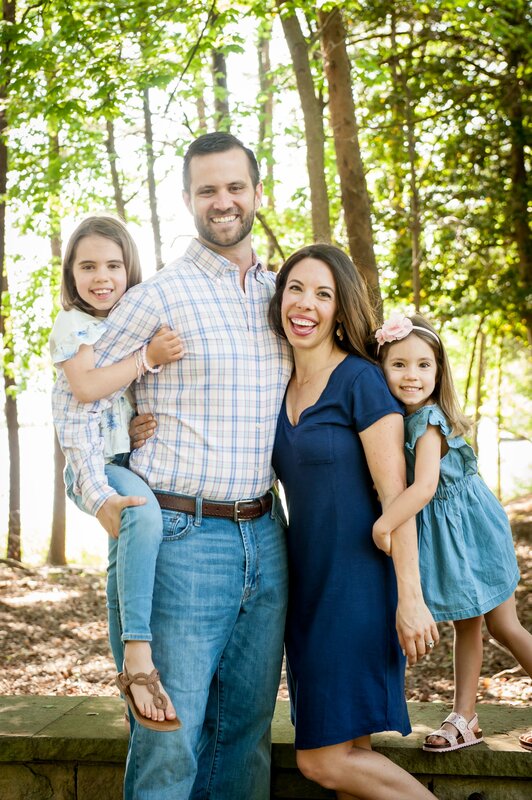 I don’t think moms need any more pressure, but I know as a mom myself, I always like hearing new ideas on how other moms do things, then I can adopt them if they work for me. I always appreciate a discussion and love that we can all listen to each other and then do what works best for us. I hope you both have a great weekend! My initial reaction was mom-guilt too! Like, ‘oh geeze, yet another time during the day when I am not doing enough to boost my kids’ IQs.’ The more I read though, the post gave me some ideas for CDs to check out from the library and podcasts to try. Currently my kids are allowed to bring one book in the car whenever we go somewhere and a toy. It’s up to them if they remember or not. I think as long as kids aren’t staring at a screen every time they get in the car, then they’re going to be just fine! There’s nothing wrong with boredom. I am thankful for moms like Brittany though who are so focused on education. The world can always use more bright young minds! Thanks so much for your input, Brenda! I hate that the post came off at all like we should be engaging our kids at all time because I’m no cruise director either and feel like boredom is so important for kids. I’m glad you got a few new ideas to check out, as that was the intent (whether executed well or not…). Hope you have a great weekend!! We love Storynory too! Our go-to most days is Stories podcast. We also love Brains On! We listen to podcasts pretty much every morning on our way to drop off my daughter at elem. school and my son at child care. Such a fun way to spend the drive and I find it sparks a lot of good conversations. Love the basket for organizing in the back! We are also on the go A LOT, but it’s not often I have all 4 kiddos with me in the car at the same time, but poor Emma gets carted all over with me and gets really bored if we will be gone for awhile. Thanks for the suggestions! I started a homeschool/preschool with her and 2 other kiddos her age from Church this year, so this will help! Try the Circle Round podcast. It’s great! I want to thank you for giving me the idea of audio CDs for car rides! 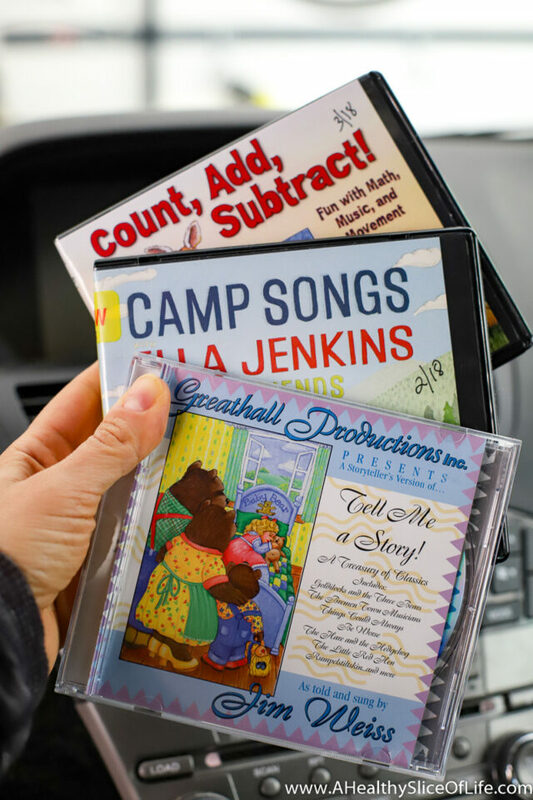 When you first mentioned the CDs I tried it for my boys and I can’t believe how quiet they are in the car compared to when we were listening to music! Definitely a game changer! Typically on the way to school (a 20 minute drive), I love to practice counting with my crew. Either counting to 100 forwards and backwards and skip counting–just whatever my kindergartener is working on at school. And it’s great because my younger two are exposed to the counting and patterns as well and chime in as much as they can. We also like the rhyme game. Basically just thinking of rhyming words. And sometimes we work on reciting sight words. It’s all very basic but they are bright and cheery (typically) in the morning. On the afternoon drive home, it’s typically just music since they are tired or I’ve had to wake my youngest up to go do pickup. Love reading about these ideas. Now, if only I could initiate a clean car system that actually worked! Kudos to you! Favorite 2 podcasts the kiddos love: smash boom best and brains on! I’ll have to check our your recommendations too! Love finding new listens.